First Solar is developing a road map to drastically increase its production capacity. President Trump's new tariff on imported solar equipment has provided a golden opportunity for thin-film solar manufacturer First Solar. The company went out on a limb years ago by bucking the trend toward crystalline-silicon photovoltaics, and it outlasted dozens of other thin-film solar contenders over the years. 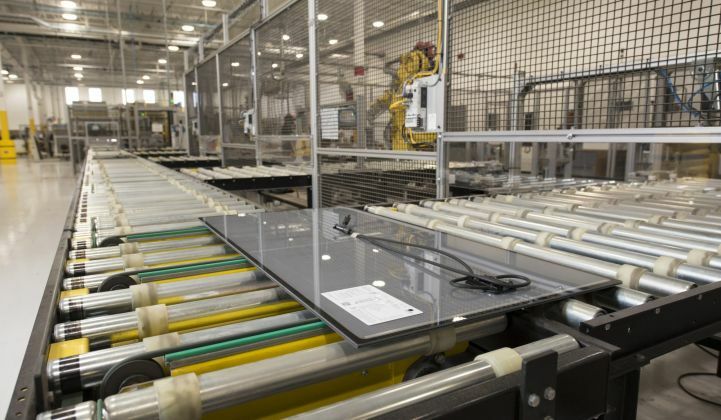 That unconventional approach paid off in a serendipitous way this year, when its cadmium-telluride solar technology was left out of the 30 percent tariff on imported crystalline-silicon PV cells and modules. "First Solar has been the beneficiary of its own ingenuity, as well as a broader policy environment that has rewarded the improvements it made to its technologies," said MJ Shiao, head of Americas at GTM Research. "It's one of the most innovative, business-savvy companies out there, as well as one of the luckiest." First Solar's earnings report last week offers a snapshot of how the company has performed amid the uncertainty that has plagued its competitors since the tariff proceeding got started last spring. While foreign manufacturers hunkered down and debated whether to open factories in the U.S., First Solar locked down a record 7.7 gigawatts-DC of net bookings last year. At the expected rate of production for 2018, it will take three years to ship the current backlog. And the company is ramping up manufacturing capacity for its new, larger format Series 6 product, both in Ohio and overseas. Those developments were matched by notable recent achievements on the developer side, including a groundbreaking solar-battery peak power plant in Arizona and a sizable power plant in the tough-to-crack Georgia market. First Solar entered 2017 with 2.8 gigawatts of modules booked, and shipped almost that amount over the course of the tumultuous year, netting $2.9 billion. The company booked another 7.7 gigawatts throughout 2017, and added another 1.3 gigawatts in 2018 before the earnings report in late February. Now it's sitting on a voluminous 9.1-gigawatt pipeline. 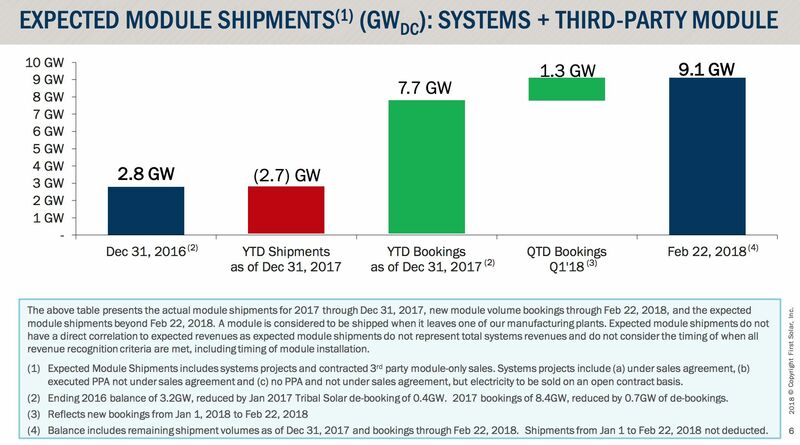 That'll pay the bills for a while, because First Solar's latest guidance predicts shipping about 3 gigawatts of modules in 2018, which is a revision up from the previous estimate. At that rate, First Solar will be working through this backlog through 2020. In the meantime, more orders will come in and manufacturing capacity will come online, so the rate of completion is bound to change. This is the first time in a while that First Solar has been sold out for years in advance, Shiao said; the last episode involved a polysilicon shortage in the early 2000s that caused a price spike for conventional PV products. "We've been operating primarily in an oversupply situation for modules," he said of the recent solar market conditions. Faced with rapidly dropping silicon prices, First Solar had to cut costs and drive up the efficiency of its panels to stay competitive. Now, the tariffs on the mainstream competition ease up some of the competitive pressure. The tariffs step down each year and disappear after four years, so this is not a long-term benefit. But it could let First Solar take in higher margins on module sales than it would have in a tariff-free environment. That said, First Solar still posted a financial loss for the fourth quarter of 2017, driven in part by a $408 million expense resulting from the tax reform passed in December. For the year of 2017, the company saw a GAAP loss per share of $1.59. Tax reform was a one-time thing, and the future is where the money's at, thanks to the jam-packed pipeline and new production capacity coming online. The company bumped up its sales guidance, and increased the expected 2018 cash balance from between $1.6 billion and $1.8 billion to the $2.1 billion to $2.3 billion range. 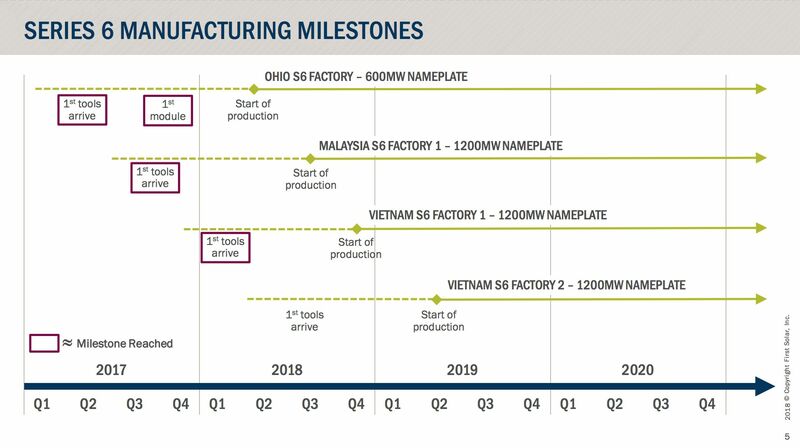 First Solar is working through a road map to drastically increase its production capacity, just in time to serve the massive demand for its tariff-free modules. The company produced 2,284 megawatts in 2017, but this was also a transition year, as it retooled to produce Series 6 modules. Due to a historical accident, First Solar now finds itself uniquely positioned to benefit when the new lines get up and running. A 600-megawatt Series 6 factory is approaching the start of production in Ohio, proving, like Suniva argued in its trade case petition, that American solar manufacturing is not dead. A tariff on foreign imports should make it easier to compete while paying for U.S. labor costs. Meanwhile, First Solar is also building 1,200 megawatts of production capacity in Malaysia and 2,400 in Vietnam, confirming, like Suniva said, that foreign solar manufacturers are able to send modules into the United States at attractive prices. In short, First Solar claims the full benefits of a global supply chain and South Asian manufacturing, while also riding the wave of tariffs meant to protect the few remaining U.S. domestic producers. One might view this as simply making the most of circumstances beyond one's control, but the firm actively intervened to support this outcome in the tariff proceeding. After months of silence, CEO Mark Widmar in October threw his support behind Suniva and fellow petitioner SolarWorld, breaking from almost every other leading U.S. solar company. The repercussions of the tariffs have struck other competitors in a variety of different ways. Take SunPower, which resembles First Solar in several respects. They both are based in the U.S. but mostly manufacture abroad; they both have a unique module technology driven by in-house R&D; they both are vertically integrated, making modules and developing projects. SunPower's high-end PV, though, does fall under the tariff, so the company has delayed and dropped projects, frozen hiring and planned layoffs in response to the trade barrier. CEO Tom Werner said last week it would put a $50 million to $100 million dent in company earnings. Solar tariffs don't stand in for a solid product and team; First Solar had those in place ahead of time. Now it's able to make the most of a scenario nobody could have predicted even two years ago.